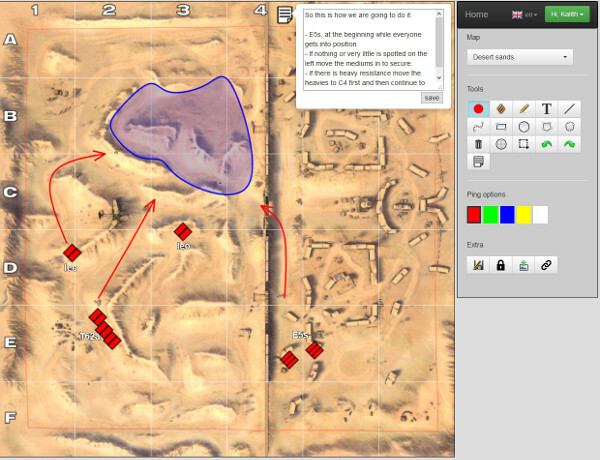 I present http://www.wottactic.tk/blitz.html, a world of tanks blitz strategy planning website. No registration or download required, just press the new room button, copy paste the link to a few friends or clanmates and you're good to start explaining and planning those tactics. Edited by Kalith, 29 September 2016 - 10:28 PM. It's awesome! Thanks for doing it! This is absolutely incredible! I love it! When clan wars come out this will be an invaluable online planning tool. Recommend you mention it in the clan area. Very well done and thank you so much! You deserve to be a Community Contributor for this. Kalith, Thank you for taking the time to develop this tool. It is very much appreciated! One point, when trying to save a Map with annotations it, for some reason, flips the Map dislocating the icons it has been annotated with. Is this just me? Can you tell me which browser you are using and the exact steps you take to cause the issue. I'll repost this in the german forum, if I may. Of course I'll clarify that it was you that developed this great tool! are there any plans to implement the creation of permanent rooms like for clans, so that everyone can browse trough the stored clan tactics without the creator of the map beeing online? Edited by Rebuster85, 07 October 2015 - 04:12 PM. Never thought about really, it's certainly doable. And sure, repost all you want. Edited by Kalith, 08 October 2015 - 08:55 PM. All tactics now remain active for 30 days, which is reset every time someone visits it. I'm having a really hard time finding an updated Desert Sands image. If there someone here who could help with that, pls get in touch ? I finally got my hands on an updated desert sands map and the upcoming canal map, thx Reluctanttheist. Added a little note tool for if you want to write a somewhat lengthier description, together with tactics being persistent I think it's now quite usable to share ideas, even if you can't be online at the same time. I've been playing with the layout, colors and outlines a little to give it a little more contrast, tell me if you like it or not. Anyway, tell me if you have any suggestions about what works and doesn't work, especially on tablets or phones. I mostly use the version for wot and mostly on a desktop, I'm sure there are issues I don't know about.